Models agreeing more today than they did yesterday on timing and track of the early-mid week storm. High pressure building in tonight, but quickly moving off to the east coast. Another bitterly cold night with lows in the mid to low teens. So starting Monday cold with generally clear skies, but increasing clouds thru the day ahead of the next cold front. The low pressure in the Gulf is spinning up and will collide with the cold front. The track of the Low will go from the panhandle of Florida to the East Coast around the Carolina s then race up the East Coast and be out of Maine by late Wednesday. Light snow will arrive for Central Ohio Monday night and into Tuesday. We warm up enough for a wintry mix, mainly SE Ohio, for Tuesday afternoon. Then most of the precip will stay to Eastern Ohio Tuesday night as temps fall and the system pulls NE. 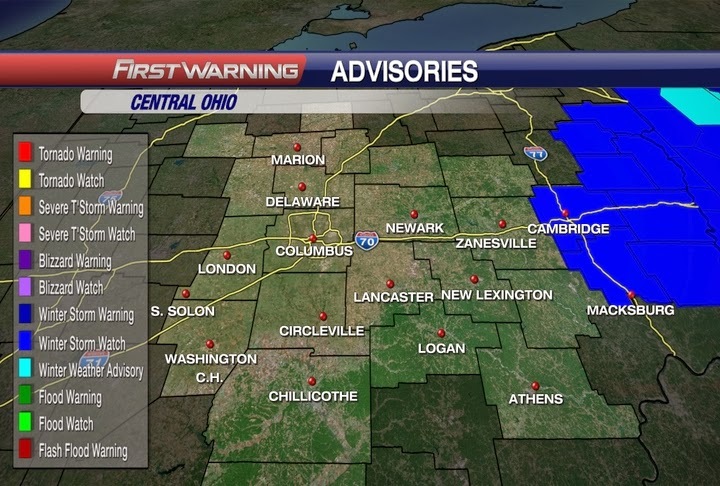 For Western and Central Ohio, I think up to an inch generally for snowfall(if not less, especially west). Far Eastern Ohio could see 2-4+" but most of the snow will be in Western PA & WV by midday Wednesday. Winter Storm Watch for Guernsey & Noble counties from midday Tuesday midday Wednesday. High pressure builds in very quickly for Thanksgiving, and thus kept the threat for lake effect action down for now. Another weak front arriving by Sunday. TRAVEL PLANS: Wednesday will be a little sketchy on the roads if you are planning on heading east. Pennsylvania, West Virginia, and Eastern Kentucky will have a significant snowfall by Wednesday afternoon. These areas should have clearer roads by Thursday as the storm system races up to Eastern Canada and the high pressure builds in for the Eastern US. #BucksFirstInchOfSnowChallenge, Snow on the way?